Richard was born in 1816 to Richard and Margaret Leeming (I don't know Margaret's maiden name). He was christened at St Mary the Virgin, Blackburn, on 4th February 1816. The parish record tells us his father was a 'sizer' and they lived in Blackburn. I know this is the right Richard because in the 1841 census, Richard (1816-1881) and his wife, Nancy and their two children, Mary Ann aged 5 and John aged 8 months are living with his parents at Appleton Row in Preston. Richard senior is 60 years old and is a cotton sizer whilst his wife, Margaret, is 55. There is also a John aged 30 and a Peter aged 13. I assume John must be Richard and Margaret's other son and Peter possibly another son or possibly John's son. Back to Richard (1816-1881). 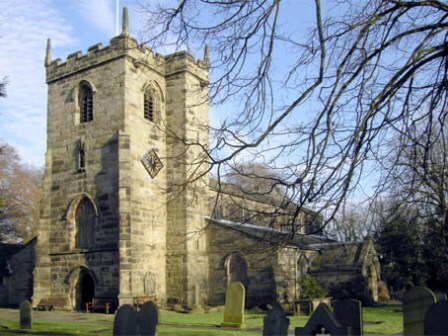 He married Nancy Catterall on 31st August 1834 at St Mary's church, Penwortham near Preston. Their witnesses were Thomas Carter and Sarah Sharples. I don't have any more information about Nancy apart from the fact that she was born in Preston in 1816. As I have said, in 1841, Richard and his wife Nancy were living with Richard's father and mother in Appleton Row, Preston, along with his brother, John and a Peter aged 13. Another clue to this being the right Richard and Nancy is that their daughter's name is spelt Murgram on the census and this is clearly an error, although it is hard to understand the writing on the census. I discovered this was, in fact, Mary Ann because there is a Mary Ann Gregson aged 45 who is living with her mother, Nancy Leman and other family members including Betsy Leeming (my great grandmother) in Bury in 1881. This is very, very, complicated but fits together like a jigsaw puzzle. And I discovered it whilst searching for Betsy Leeming in the 1881 census. It is clear, from the following census of 1891, that Nancy Leman is in fact Nancy Leeming as she is still living at the same address but with the name Leeming. It was also confirmed when I found the marriage of Mary Ann Leeming to George Gregson. Back to the 1841 census. I cannot read what it says the occupation of Richard is, but it is the same as his brother, John. Nancy is a power cotton weaver. It looks like the family moved to Blackburn around 1847 as several of their children are born there yet by 1851 they are back in Preston, living at at 11 Sedgewick Street. Richard is head of the family and is 34, he is a mechanic. It has Ann down as his wife, who is 33 and born in Preston. The family includes Ann, their daughter (i.e. Mary Ann) who is 16 and a power loom weaver; John aged 10, James 4 and Richard 1 month; it says all were born in Preston, whilst Margaret, aged 2, is down as being born in Blackburn. Whilst this census has Richard's wife down as Ann I feel there are too many similarities with ages, names of children, occupation and places of birth for this not to be Nancy. It is possible she used both names as many of us change our first names over time. Their stay in Preston doesn't appear to have lasted long because by 1853 they are back in Blackburn and in 1861 they are living at 38 Lyon Street, Blackburn. Richard if 45 and still a mechanic; Nancy is the same age. James is 14 and a cotton creeler; Margaret is 12 and a cotton weaver; Betty is 6 and Nancy 4. Ten years later and the family are living at 20 Audlem Street, Bury. Richard and Nancy are 55 and Richard is still a mechanic. Betsy is 18 and a weaver; Nancy 14 and a card room hand; and they have a lodger, Mary Porter who is 62 and a seamstress. Many of the family on my mother's side worked in the cotton industry and I talk about this, including the Cotton Famine at James Ward (1847-1920). To find out more about the different jobs in the cotton industry click here. Richard dies in 1881; I still need to acquire his death certificate.